The completion of The Fontenay has enriched Hamburg with a timelessly modern, luxury class hotel. Standing directly on the shores of the Outer Alster lake, this ‘modern classic’ succeeds in creating a remarkable blend of urban nature and cosmopolitan lifestyle. The hotel sets new standards not only in respect of its architecture and interior, but also in terms of guest protection and building security. For the latter aspect, the hotel relies on an innovative solution from Dallmeier. The foundation stone was laid for the hotel The Fontenay in the spectacular Hamburg Alsterpark in August 2014. The ceremony took place on the property of its former owner, the man after whom the hotel is named: ship broker John Fontenay. After a construction period of about three-and-a-half years, the new five-star superior luxury hotel with 130 rooms and suites finally opened in March 2018. 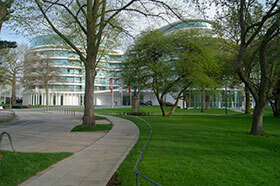 The striking architecture of the hotel was designed by the star Hamburg architect Jan Störmer. The basic layout of the hotel consists of three merged circles, so that no wall in the spectacular building runs parallel to another. It therefore goes without saying that a hotel of such distinctive form must also have a custom-designed security solution. Naturally, the planning partner also has a critical part to play in implementing precisely this requirement. The choice was ultimately made for Dallmeier, and Dallmeier subsidiary Dekom Video Security & Network was tasked with management of the project – since its main offices are in Hamburg it is ideally positioned to ensure the requisite technical expertise and quality. The first planning meetings were held as early as 2015, at which the customer laid out its strict specifications: Accordingly, the highest degree of security must be afforded without giving the guests occasion to feel importuned or under observation, and without detracting from the architecture. For example, visitors should be able to enjoy unrestricted views of the imposing, 27-metre high circular atrium and its seven metre long light sculpture. Another important consideration was that the video security system should be sustainable into the future. The Fontenay also insisted most particularly that the solution should conform to data protection requirements. Wolfgang Haack, managing director of Dekom, explains: "The entirely justified wish on the part of the customer to ensure security for all areas with video security technology often conflicts with the demands of data protection. Our objective was to reconcile these concerns." Based on the specifications, it quickly became clear that security must be assured for the expanses of the hotel using the smallest possible number of cameras. This meant that only ultra-HD cameras could be considered so that the entire video security system could be kept discreet and unobtrusive. For system planning purposes, this approach in turn entailed the use of appropriate network components and in particular of powerful servers for recording. The Dallmeier systems are capable of storing these enormous quantities of data and backing them up redundantly – also for prolonged periods of time. Dekom project manager Kai Gebhardt recounts: "Given the large quantities of sensitive data, it became clear very early that in this project data protection and data security must be considered very carefully. The combined data protection and data security module from Dallmeier guarantees secure operation and helps the customer to comply with all requirements of the GDPR." In order to provide rapid orientation for the hotel staff in the new video security system as well, a team from Dekom was deployed to the site and instructed the hotel security personnel thoroughly in the system and the management software. These individuals were also very impressed by the ease of use of the overall system.